'It is impossible,' he wrote, 'for any troops to have surpassed... the gallantry displayed in this attack. " The Battle of Chilianwala certainly makes for very interesting reading (please take the time....) and the part played by the 24th foot is rather impressive...wouldnt you say ? "On January 9th Gough started advancing. The new Sikh position was on the left bank of the Jhelum and faced about cast, covering a front of six miles. Most of the Sikh regulars were on the right of this line, in front of which stretched rough ground covered with jungle: to the left, where the Sikh irregulars were posted, the ground was steeper and ravines rendered it almost inaccessible. The position was partially entrenched and the Sikhs, who numbered nearly 30,000 to Gough's 13,000 had over sixty guns, so that an attack was not to be hastily undertaken. The firing had hardly opened before the British bugles sounded the 'Alarm,' followed by the 'Assembly,' and in a minute the men were standing to t heir arms, ready to unpile and fall in. Caught by surprise though they were there was no disorder or confusion, and if Gough had been taken at a disadvantage, mainly through the difficulties of reconnoitring, he did all he could to rectify the position. The jungle was so thick that Campbell, thinking it to be hopeless to try to control both brigades, went off to the outer flank to direct Hoggan's movements and connect them with those of the cavalry, merely telling Pennycuick and the Twenty-Fourth that there was to be no firing but the work was to be done with the bayonet. At first, the advance was steady enough, but when the battalion came within range of the enemy's guns a tremendous fire was opened and almost instinctively the pace quickened. Whether Pennycuick ever ordered the charge will never be known. Sir Charles Napier, who investigated the matter carefully, is emphatic that he did not, that the change from 'an advance in quick time' into 'a rush forward' was quite spontaneous, the inevitable result of 'the excitement of danger,' the 'zeal of the soldiers to close with the enemy' and the impossibility of controlling the advance in such country. He is emphatic that 'there was nothing for a brave and able commander to do but what Colonel Pennycuick did-dash forward, cheering on his men, and by his example supporting the impulse he could not check and ought not to check.' Even if the Twenty-Fourth charged at too great a distance from the enemy it was 'the noble course,' and had the regiment's rapid advance only been properly supported all might have been well. It was the grenadier company, now on the right flank, who first reached the guns, the jungle in its front having been less thick than elsewhere. A counter-attack drove it back, but Captain Travers promptly rallied it and a second advance carried the position, the rest of the regiment arriving almost simultaneously. Round the guns a desperate struggle raged: the Sikhs fought furiously for their cherished pieces and only after a desperate resistance were the gunners overcome. Sikh infantry from rising ground in the rear blazed away vigorously, not minding if they shot down their own gunners if they could cheek the victorious Twenty-Fourth. Some of the men had been provided with jagged nails to jam into the touch-holes to render the guns unserviceable and several were treated in this way. Lieutenant Lutnam, one of Macpherson's tree-climbing companions, has described how he contrived with the aid of Private Stanfield of the grenadier company to put one gun out of action, and another was spiked by Sergeant Lear of the same company, but before the majority could be disabled the Sikh infantry were counter attacking in force and the remnant of the Twenty-Fourth was hard pressed to hold its ground. It was indeed a remnant, the centre companies in particular having been virtually annihilated, and if, as Napier grandiloquently wrote, it was 'master of the position' and its 'glory was complete,' it was alone in its glory, 'isolated and unsupported.' The whole Colour-party had been shot down, both Lieutenant Phillips and Ensign Collis being killed when within a few yards of the guns, where Colonel Pennycuick also fell, his son, the junior Ensign, just joined from Sandhurst, who dashed to his father's side, being shot down as he reached him. Colonel Brooks was attacked by three Sikhs, who dashed out from under the guns, but they were bayoneted by men of the grenadier company. The Colonel, however, was killed almost immediately afterwards; two Majors, Harris and Paynter, were desperately wounded, Captain Travers of the grenadier company was cut down by a swordsman, and before long two-thirds of the officers had been disabled and very few were left to direct the resistance to the vigorous counter-attacks of the Sikh infantry. The particularly heavy losses, which the centre companies had suffered, proved a special disadvantage. The line was weakest in the centre and the counter-attack, breaking in here, separated the battalion into two wings. No support was forthcoming from the Sepoy regiments whom the regiment's rapid advance had left far behind and, fighting desperately against overwhelming numbers, its remnants were thrust back through the jungle, losing heavily as they fell back. Not until the open ground on the far side of the jungle was reached was it possible to rally and reform. Altogether the Regiment, which had gone into action with 31 officers and 1,065 NCOs and men, had 13 officers and 225 men killed, 9 officers and 278 men wounded, in all nearly half its strength. The Queen's Colour was lost, It may have fallen into a pool when its bearer, Lieutenant Phillips, was hit; another account says that the staff was broken, and that Private Connolly wrapped the Colour round his body to secure it, but he too was killed and presumably buried without the Colour being discovered. It certainly never fell into the Sikh's hands, as did the Colours of the 25th and 45th NI. Had the Sikhs secured it, they would have certainly displayed it to a British officer, a prisoner in their camp, to whom they proudly exhibited their other trophies. The Regimental Colour, rescued by Private Perry when Ensign Collis fell, was safely brought in." It now hangs in the Regimental Chapel in Brecon Cathedral, together with the Queen's Colour presented in 1850. Oh drool! You lucky so-and-so! Wish it were mine! Yes, nice one. 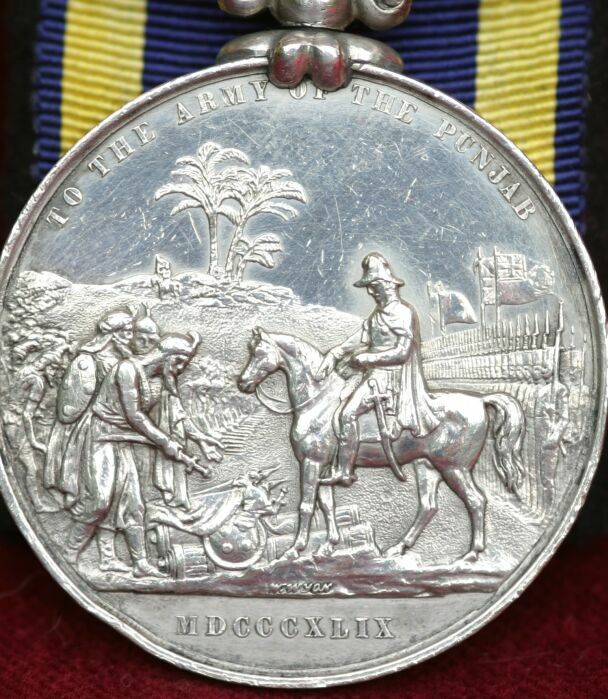 The attachment of second clasps on medals where the first clasp was "earless" is often an opportunity either for the second clasp to go walkabout or for the regimental blacksmith to practise weird and sometimes wonderful exercises of his craft. The Sikh Wars -- like the medals for those campaigns -- are among the most understudied and underappreciated of the HEICo's outings. It is often ignored, for example, that the campaigns and the medals were not "crown", but "company" undertakings. And the First Sikh War represented the first use of clasps, though in as yet a "mixed" usage (first battle on medal, second on clasp; by the Second Sikh War, this system had come of age, only to die an ugly death late in the 20th century (in both India and the UK). Very nice Chris What year did this take place? A lovely piece. Many years ago I had one like it to Pte. Corker of the 2nd Bengal Europeans. Long gone, now. 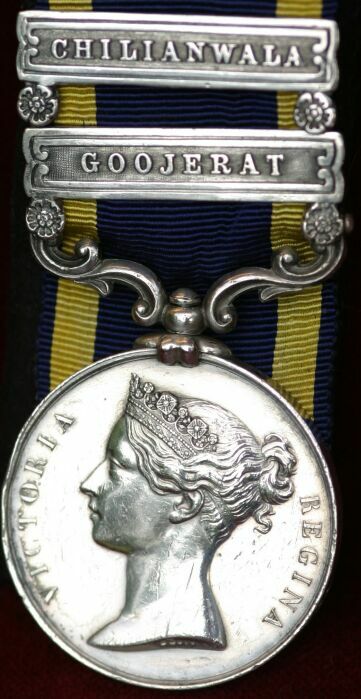 Great medal-and Hard fought battles- "a Waterloo every one" one General later said. Certainly the British casualties were enormous and few realize that the Seikh army was as good-if not better- than most European armies. The Seikhs were also French trained are there are accounts of old French Napoleonic officers facing off against their British enemies -30 years later. You have had more of these than I have, do you see any problem with the loose bar? A reservation was raised about 1) he has only Gooj on the Roll, and 2) the clasps were obviously recently mounted. 1) the medal was issued with Gooj and the lugs capped. Then he was given auth for the Chili bar and it was to late to mount it, so it became a slip on. 2) I dont think there is a way to tell with silver WHEN something was done to it. It looks all neat and logical to me. I think if someone wanted to mess with this he would have taken the perfect bars from the medal of a lesser unit to mount on the 24th foot and put these on the other one (By "lesser" I mean "cheaper" unit). Anyway, in my mind it is logical as to why the medal "is like it is" is. Would like to get some other thoughts to this though. It is hard to say. 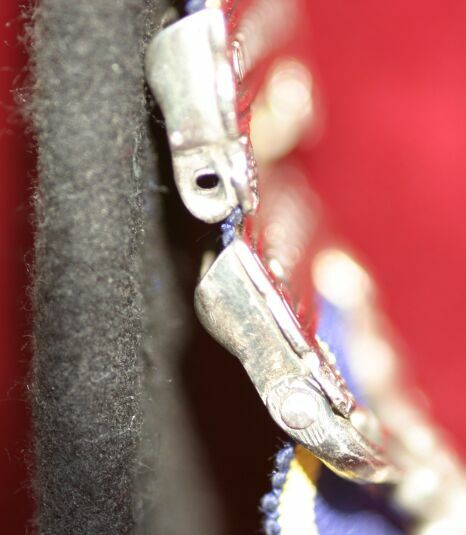 There was much confusion in this period (as there had been with the medal for the First Sikh War) over the unfortunate practice of issuing clasps without "ears" and then issuing subsequent catch-up clasps. I would agree with your very logical scenario with the only possible hesitation lying in the chance that this may have been a post-research collector "restoration" by slipping a "harvested" clasp on a medal (some dealers seem to revel in providing these stripped clasps ). Yet the similarity of wear leads me to suspect this may well be period and that the two clasps have remained with the medal only by tremendous luck. Personally I find the medal both very plausible and very nice. If I collected medals to natives (of the British Isles), I'd be most envious. Not to hijack your thread, Chris, but I thought I'd offer a bit more "eye candy". One for the "first round" and two for the "second and last round". 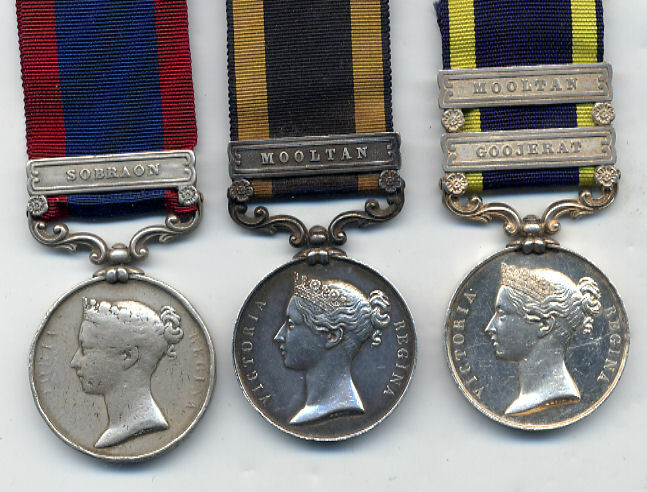 2- Punjab Medal - "MOOLTAN", named to "PRIvt MATTA BUCCUS 4TH BATTn ARTILLERY." I thought they only practised removing the clasp "Ears" on the 1854 IGS....now i know different. How many of these were awarded? I have, and let me find, numbers for the Indian Army. I can't say, however, as far as medals awarded to natives (of the British Isles) are concerned. Thanks Ed!! Regardless... 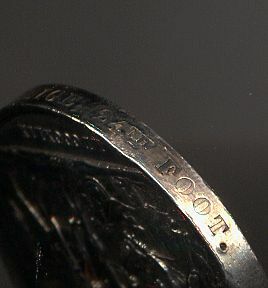 I bet that it is amongst the rarest of the British medals?